THE STORY - When Senator Joseph McCarthy begins his foolhardy campaign to root out Communists in America, CBS News impresario Edward R. Murrow (David Strathairn) dedicates himself to exposing the atrocities being committed by McCarthy's Senate "investigation." Murrow is supported by a news team that includes long-time friend and producer Fred Friendly (George Clooney). The CBS team does its best to point out the senator's lies and excesses, despite pressure from CBS' corporate sponsors to desist. THE GOOD - Tremendous black and white cinematography, a stirring performance from David Strathairn, and a message that is as timely now as it was upon the film’s initial release in 2005. THE BAD - The abundance of first-rate actors means that a couple cast members (Most notably, Patricia Clarkson) are saddled with thinly drawn character arcs that do not rise to the level of their talent. ​“Good Night, And Good Luck” arrived in theaters on October 7th, 2005, in the midst of a turbulent presidency. Co-written and directed by George Clooney (Clooney is also one of the stars and producers), the film chronicles the courage and moral conviction of Edward R. Murrow, who, along with his team of producers and researchers at CBS News, devoted a significant amount of airtime in 1953 to the fight against McCarthyism. At a time in which many news outlets and corporate bigwigs were fearful of publicly confronting Senator Joseph McCarthy due to the risk of being labeled a communist and a traitor, Murrow and his colleagues refused to buckle under pressure. They saw it as their mission - the dismantling of a fear-mongering crusade, one led by a morally blind conspiracy theorist in the nation’s capital. In other words, “Good Night, And Good Luck” is as timely now as it was twelve years ago. Murrow’s legacy continues to serve as a shining light for those engaged in the struggle of opposition. Murrow’s awareness of the need to take a stand against McCarthy’s witch hunt symbolizes the responsibility of journalists to separate fact from fiction, a responsibility that adherents of “both sides-ism” frequently shirk. “Good Night, And Good Luck” transcends the era in which it is set to become a universal meditation on the tenets of sound political journalism. The era in which it is set, however, is beautifully rendered in every black and white frame. As Clooney’s latest directorial effort, “Suburbicon,” enters theaters this weekend, it is worth noting that “Good Night, And Good Luck” remains his signature achievement as a filmmaker. This is one hell of a stylish and assured movie. The black and white cinematography accentuates the cigarette smoke that fills the air of Murrow’s newsroom and the beads of sweat that appear on Murrow’s forehead during tense moments on set. Clooney, working with the great cinematographer Robert Elswit (Oscar winner for “There Will Be Blood”), is in command of his atmosphere here. In addition to its visual beauty, “Good Night, And Good Luck” makes deft use of archival footage. Senator McCarthy is played not by an actor, but by the man himself, shown in historical clips from his congressional hearings and public addresses. This produces a powerful fusion between art and reality and allows the viewer to grapple with the sobering primary source material. “Good Night, And Good Luck” boasts an impressive array of performances. 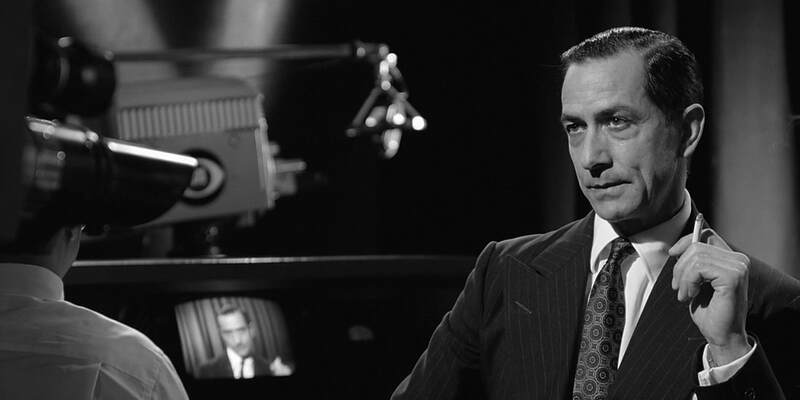 David Strathairn received an Oscar nomination for his impeccable portrayal of Edward R. Murrow. Strathairn’s every maneuver, from his handling of his cigarette to his calm but forceful monologues to the way he looks at his colleagues in quiet empathy, exudes authority and reassurance. The supporting cast hits all the right notes as well, with the most affecting performances coming from Clooney as Murrow’s loyal producer Fred Friendly, Frank Langella as the cautious CEO William Paley, and Tom McCarthy as Palmer Williams, who risked personal fallout by allying with Murrow. In real life, Clooney is the son of a newsman (Nick Clooney), and he pays tribute to his father’s profession by creating meaningful roles for a variety of behind-the-scenes players, all of whom played a crucial part in bringing Murrow’s program “See It Now” to fruition. It is a joy to watch a movie over a decade after its initial release and realize that, in terms of craft and content, there are no time-worn blemishes. “Good Night, And Good Luck” lays down a template for thoughtful resistance in the media during times of injustice, as well as a template for filmmakers looking to produce works full of style and conscience.